I took a picture of the show window of “Front and company”. The shop sells consigment clothes for men and women, accessories, gifts, and bags. The accessories are good here. My sister bought a pair of shell earrings and a matched bracelet which looked very summery. The shop can sell your own old clothes and 40% of the sales price will be yours. 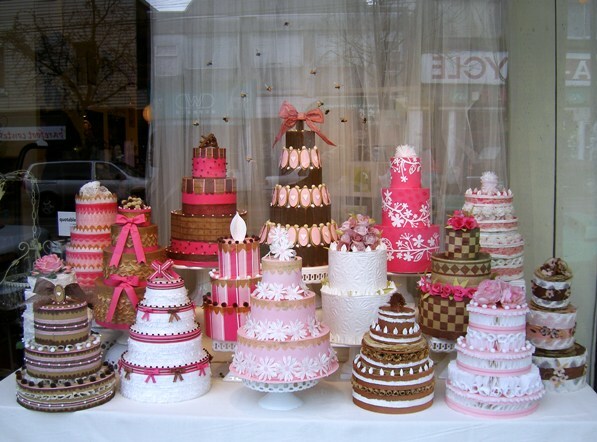 The shop always has nice show windows and this time, the many kinds of wedding cakes were really pretty. Everything is made out of paper. Can you see the bees flying around the cakes? After I took a picture I was told NOT to take pictures. My honey said maybe it was due to artists’ right or something, but should I take another picture next time?